January 15, 2018 -- Affluent consumers -- those making more than $100,000 annually – are becoming more price sensitive as they embrace industry disruptors such as artificial intelligence (AI), Amazon and mobile technology to compare prices, according to the results of a new survey by First Insight, a technology company transforming how leading retailers make product investment and pricing decisions. In fact, 42 percent of affluent shoppers now frequently shop at discount retailers versus only 27 percent at full price retailers, with 36 percent saying their discount shopping has increased. Twenty-one percent of affluent respondents also reported they were more inclined to visit online discount retailers, compared to only 12 percent of overall respondents. Results of the survey, which queried 1,000 participants in the U.S. on their shopping habits, purchase behavior and influences driving purchase decisions, were announced today during the NRF Big Show 2018 in New York City. Download the infographic that illustrates the key findings of the survey here. According to the findings, a vast majority of affluent consumers (74%) check Amazon.com for products and pricing before looking elsewhere, versus 60 percent of overall consumers. This is likely driven by the affluent shopper’s view that product pricing online is better. Half of affluent respondents felt that prices of products in physical retail stores are increasing, while slightly less (46%) felt online retail stores’ pricing was increasing. Of note, while 61 percent of affluent respondents said their number of Amazon purchases increased in the past year, 80 percent said they were unwilling to pay more for two-day shipping, underscoring growing sensitivity to prices. Forty percent of affluent respondents surveyed own a smart speaker such as Amazon Alexa or Google Home, compared to only 24 percent of overall survey participants. Amazon Alexa or Echo is the most popular smart speaker among affluent shoppers, owned by 24 percent. More than half (53%) of affluent users are utilizing their smart speakers’ AI technology to research pricing, with the most popular items being electronics (65%), apparel (48%), shoes (42%), home appliances (38%) and jewelry (31%). 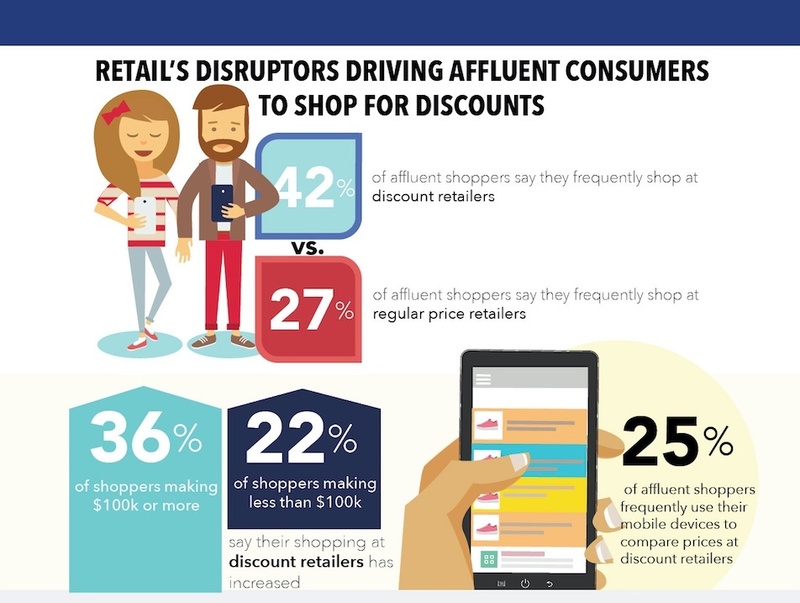 Affluent shoppers are also much more likely to price compare using mobile devices while at full-priced retail stores. According to the study, 44 percent of affluent respondents (compared to 38% overall) are more likely to price compare at full priced retail stores, while only 19 percent are more likely to price compare at discount retailers (versus 15% overall). Favorite discount retailers include TJ Maxx (30%), Marshalls (28%) and HomeGoods (23%). Thirty-nine percent of affluent shoppers are using their mobile devices to price compare while in-store, compared to only 26 percent overall, and the need is growing. The result of the study indicated that more than half (52%) of affluent respondents noted that their need to price compare while physically in-store is increasing, versus 46 percent overall. While the affluent are price checking in-store, the survey found that the two most important factors that would make them want to shop in a physical store versus buying online are being able to see and touch the product (36%) and being able to take a product home (26%). Price promotions and coupon availability were important to only 10 percent of affluent respondents, and only 12 percent said they felt they’d find better prices in-store, compared to 17 percent overall.